Summer is a wonderful time of year to be outdoors enjoying nature and comfortable weather. A vast majority of people participate in outdoor activities such as hiking, camping, gardening, and tackle a variety of yard work or outdoor home projects during the summer. Although summertime offers a multitude of outdoor splendors, it is also the time of year when people are most susceptible to the toxins of poisonous plants. Here are some tips on poisonous plants to avoid. The best way to avoid poisonous plants during the summer season is to educate yourself, and teach children to recognize and identify dangerous plants that are native to their local area or yard. In the United States, the most common poisonous plants include poison ivy, poison oak, poison sumac and stinging nettles. Anyone unfamiliar with these plants should take the time to search the internet for identifying photos and descriptions, or peruse books and publications that provide photos and information on these particular plants. Most books and informational sources will urge outdoor enthusiasts to avoid poisonous plants bearing �leaflets of three�, or more accurately, vines or low shrubs that contain shiny green leaves in groupings of three. Poison ivy, poison oak and poison sumac - top in the list of poisonous plants to avoid - all contain a toxic oil called urishiol. (Pronounced You-ROO-shee-all.) Once this oil comes in contact with human skin, a rash or irritation may occur. Typically, the rash will appear as red and scaly area with clear or white bubbles that will rise from the skin. The worst aspect of any rashes caused by urishiol toxins is the fact that they are incredibly and unbearably itchy! brushes against a stinging nettle, these hairs will release a mixture of chemicals including acetylcholine, histamine, formiacidde and serotonin. The sensation of stinging nettles on human skin has been described as similar to the experience of being stung by a pack of bees. 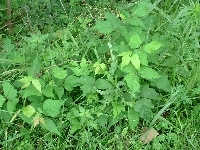 Fortunately, the irritation caused by stinging nettles only lasts for a few hours at most, while a poison ivy rash can last for days or even weeks in severe cases. While stinging nettles are not generally on the list of poisonous plants to avoid, because they are not truly "poison," they should be avoided when outdoors. Wearing long pants, and long sleeve shirts while hiking, camping or gardening is the best way to avoid poisonous plants. It is also wise to wear boots and gloves when doing any intensive gardening or yard work that might lead to contact with poisonous plants. Applying an over-the-counter skin-barrier product called Bentoquatum is another preventative measure that can keep urishiol from penetrating the skin. Most drugstores carry Bentoquatum during the summertime months. The product is highly recommended for individuals who are extremely sensitive or susceptible to poison ivy. If you suspect that contact with a poisonous plant has occurred, its best to wash the affected area with warm water and soap. Immediately taking a shower and thoroughlyy washing with soap can help to prevent urishiol oil from spreading.. Despite one's best efforts to recognize poisonous plants to avoid and minimizing contact with them, sometimes those aggravating rashes appear anyway. If you do acquire a rash from poison ivy, poison oak or poison sumac, start with over the counter treatments such as calamine lotion, oatmeal baths, baking-soda solutions or herbal supplements. If the rash becomes severe or simply does not respond to topical ointments, visit a doctor to obtain a stronger prescription medication. Doctors and medical experts also recommend thoroughly washing or laundering clothing or other materials that may have come in contact with poisonous plants or urishiol oil.